Space shuttle Discovery sails high over the southwestern coast of Morocco in this image taken by International Space Station astronauts just after the two vehicles undocked on March 7, 2011 during the STS-133 mission. The chief science legacy of NASA's space shuttle program may be the International Space Station, the gigantic orbiting lab that shuttle missions helped build over the past 13 years. But lots of interesting research has also been done aboard the shuttles themselves since they started flying in 1981. Long before the station was up and running, space shuttle missions broke new ground in many different fields of research, taking advantage of the microgravity environment to perform studies that couldn't be done on terra firma. Researchers first noticed this characteristic in studies performed aboard Atlantis' STS-115 flight in 2006 and the STS-123 mission of Endeavour two years later. And it's not a subtle change; Salmonella becomes three to seven times more virulent in microgravity conditions, researchers have said. Scientists believe that the bacteria get ramped up because spaceflight tricks them into behaving as if they're inside the human gut. The shuttle missions also identified dozens of genes that seem to be involved in the hyper-virulence, as well as a "master switch" protein that regulates many of these genes. The biotech firm Astrogenetix worked with NASA to conduct and extend this research, and the company recently developed a Salmonella vaccine based on it. Astrogenetix is also performing space-based studies of other pathogens, such as dangerous methicillin-resistant Staphylococcus aureus (MRSA) bacteria, with the aim of finding better treatments down the road. The Tethered Satellite System (TSS) being deployed from the space shuttle Atlantis during STS-46 in 1992. The photo was taken from onboard the shuttle. The experiment, called the Tethered Satellite System (TSS), was a joint effort between NASA and the Italian space agency. The idea was to show that tethered satellites could generate electric current as they cruised through Earth's magnetic field. During STS-46, the tether unspooled just 840 feet (256 meters) from Atlantis before the reel jammed. Four years later, 12.2 miles (19.7 km) of cable were released before the 0.1-inch (0.25 centimeter) tether snapped, sending the probe shooting away into a higher orbit. Though neither attempt was 100 percent successful, the TSS belongs on this list for its scale and ambition alone. And the 1996 experiment did return some interesting results. Before the tether snapped, the TSS had been generating 3,500 volts and up to 0.5 amps of current, according to NASA officials. A miniature rose grows in a special Astroculture chamber as part of a 1998 space shuttle mission experiment to study new scents in space. It sounds like some sort of symbolic or ceremonial gesture: The shuttle Discovery carried a single rose to orbit on its STS-95 mission in 1998. But there was science, and business, behind the move. The company International Flavors and Fragrances (IFF) wanted to see how microgravity altered the sweet and familiar scent of a rose — and if a new perfume component might come out of the experiment. So IFF sent a miniature rose plant up, and shuttle astronauts sampled its volatile oils, which carry the essential odors of the flower. It turned out that the space rose produced fewer volalites than its counterparts did back on Earth. And, more importantly, its overall fragrance was entirely different. IFF commercialized the space rose odor, which has since been incorporated into "Zen," a perfume put out by the company Shiseido Cosmetics.NASA flew another rose on a space shuttle in 2007, but that flower was destined for the annual New Year's Rose Parade in Pasadena, Calif., not a perfume. Of the dozens of studies performed on that 10-day flight, one stands out nearly three decades later: STS-9 astronauts cultivated the first protein crystals ever grown in space. Scientists found that crystals grown in space are larger and more neatly ordered — and thus easier to subject to X-ray structural analysis — than those grown here on Earth. Space-grown crystals therefore have great potential to help scientists understand how certain proteins work, perhaps leading to better and more targeted drugs in the future. The free-flying Wake Shield Facility was photographed from the space shuttle Endeavour during the STS-69 mission in 1995, prior to being re-captured by the orbiter's Remote Manipulator System. Many shuttle experiments over the years have focused on developing or testing out new materials. One such study was the Wake Shield Facility (WSF), a 12-foot-wide (3.7-m), free-flying stainless steel disk. The WSF was designed to fly behind the space shuttle for several days, then be captured again. As the disk zipped through space, it would create a vacuum in its wake 1,000 to 10,000 times better than anything that can be achieved on Earth. The WSF would take advantage of this vacuum to grow extremely thin and pure films that could find applications in many different fields, such as the manufacture of semiconductors. The experiment went up on three shuttle flights: Discovery's STS-60 in 1994, Endeavour's STS-69 in 1995 and Columbia's STS-80 in 1996. Hardware issues kept the WSF from being fully deployed on the first mission, relegating it to a place at the end of Discovery's robotic arm. But it flew successfully in the shuttle's wake on STS-69 and STS-80. The WSF experiments helped researchers learn how to craft better photocells and thin films of various materials, including ceramics that could be used to make artificial retinas. The space shuttle Columbia's STS-107 mission in 2003 was devoted almost exclusively to science and research. It carried dozens of experiments, including one that investigated the growth and reproductive behavior of the nematode worm C. elegans in microgravity. Tragically, Columbia and its seven-astronaut crew were lost when the orbiter disintegrated upon re-entry to Earth's atmosphere due to heat shield damage. The nematodes, housed in specially designed canisters, survived the tragedy and were recovered alive. While the worms' survival is but a tiny and peripheral part of the heartbreaking Columbia story, it taught scientists some lessons about the tenacity of life, and how it might spread from planet to planet. "It's the first demonstration that animals can survive a re-entry event similar to what would be experienced inside a meteorite," Catharine Conley, then of NASA's Ames Research Center in Moffett Field, Calif., said in 2005. Conley was principal investigator of the Columbia nematode experiment. "It shows directly that even complex small creatures originating on one planet could survive landing on another without the protection of a spacecraft." 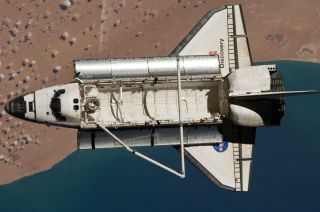 Descendents of the STS-107 nematodes have flown on subsequent shuttle flights, including Endeavour's final STS-134 mission in May 2011.